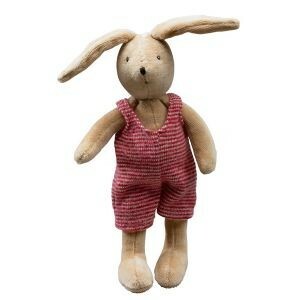 This is baby Sylvain the rabbit and he is from the very popular Grand Family range of soft toys by Moulin Roty. Baby Sylvain is wearing pastel striped dungaress which can be removed. He has a lovely beige soft plush body and measures 20cm from paw to ear. 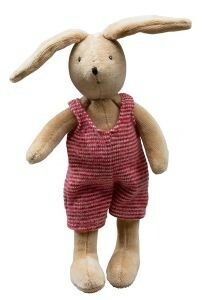 This soft toy is supplied with a Moulin Roty gift bag so is ready to give as a lovely baby shower or new baby gift. Machine washable and suitable from birth.